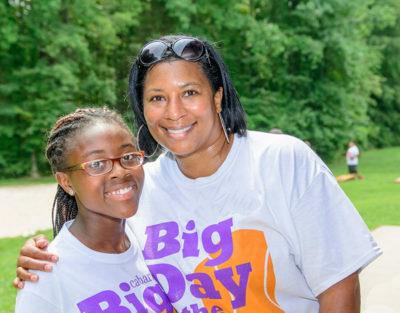 Since 2004, Big Brothers Big Sisters has been providing mentoring programs to children facing adversity in Cabarrus County. With support from the community, Big Brothers Big Sisters has experienced tremendous growth in Cabarrus County, increasing the number of children served from 103 in FY 15 to 233 in FY 18. Current goals include strategic expansion of programming, increasing community awareness, engaging new members to serve on the Cabarrus Leadership Council, assessing community needs, and identifying new resources to support programming. In partnership with Atrium Health NorthEast , Cabarrus County Schools we also have a workplace mentoring program, Beyond School Walls. The program pairs Atrium employees with middle school students, who will travel to Atrium Health twice monthly during lunch. In addition to forming friendships with their mentors (Bigs), students develop career readiness skills and expand their knowledge about the career opportunities available in the community. Big Brothers Big Sisters has a Bigs in Blue in Cabarrus County, a one-to-one mentoring program that connects local police officers and first responders with youth at school. If you are interested in learning more about this committee, please email Connie Rheinecker. Thanks to Perry Productions for capturing the magic of these Big-Little relationships. If you are interested in making a difference by serving as a mentor for a child, please visit our Be A Big page.